"So you want to know my name? Which one do you want me to give you?" Brogran Greybeard grew up in Skullport, where he was raised by Warwick, a retired human rogue. Warwick had found the Duergar infant amidst the wreckage of a caravan that had been wiped out in a drow ambush in the tunnels outside of Skullport. For Warwick, taking in orphans had becoome some what of a hobby. When he found Brogan, Warwick had already been raising Grazz, a young Gnoll child, for two years. Warwick owned a curiosities shop in Skullport, and Brogan and Grazz were groomed to take over for the aging rogue. But Skullport was a treachorous place, and the old crafty rogue also taught his two adopted sons every tool or his former trade. This training proved valuable, as both Brogan and Grazz used these skills to reclaim shipments that had been stolen enroute to the shop as well as keep rivals who were willing to stop at nothing to eliminate the competition at bay. In 1365, at the age of twenty-four, Brogan lost his adopted father. Warick had finally succomed to old age, and with the old rogue gone, his old enemies started to move in on his turf. Brogan and Grazz, despite now being skilled rogues themselves, found themselves out numbered and in mortal danger. As fate would have it, and unbeknownst to Brogan and Grazz, in the final year of his life, their father had been supplying information as to the goings on in Skullport to a powerful contact above in the city of Waterdeep. 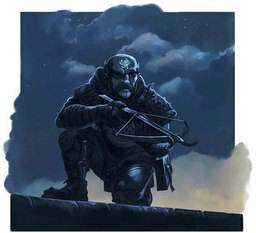 The contact, a drow elf named Gaerd, who was part of the secret Order of the Phoenix, now came to the aid of his former spy’s sons. Within a ride, the rival had disappeared and his allies were either dead, or had fled Skullport. Gaerd then offered both Brogan and Grazz a proposition: The Order of the Phoenix would buy their shop, and turn it into a business that bought and sold all manner of magic items. Brogan and Grazz would be the front for the business, and the Order would provide a number of agents to support them down in Skullport. Gaerd also asked Brogan and Grazz to continue the work their father had started, providing information for the Order. And so it was in 1365, that Brogan Greybeard became Bromburg, and a new magic shop, Bromburg’s Trinkets and Things, opened in city Skullport.